It’s a question we don't really want to raise: "How do people die from lung cancer?" Yet, at the same time, it’s an important question for some people for a few reasons. Why Should We Ask How Lung Cancer Causes Death? Perhaps the most important reason to ask how lung causes death is that, if we know how death may occur, some lung cancer deaths may be prevented. Knowing the causes may also help us improve the quality of life for people in the advanced stages of lung cancer. For example, by knowing that blood clots in the legs (which can break off, causing pulmonary emboli) cause a certain percentage of lung cancer deaths, family members can familiarize themselves with the signs of blood clots and help their loved one seek medical care if the presence of a clot is likely. Another reason to discuss what causes death from lung cancer is for the benefit of family members—at least family members who ask the question I did when my father had late-stage cancer: "How will he die?" I wanted to know the answer so I would have some idea of when to call the rest of my family to gather near. And to be honest, I also feared that he would have a lot of pain. I wanted to know what would happen near the end so I could anticipate—and be ready to help—in any way possible. Before reading on, we are aware of how difficult it can be to read these words if you have a loved one who is nearing death. Even if it’s totally expected, death is never easy. If you are alone, it might be best to wait until you can look at this information with a friend or loved one, who can be a shoulder to lean on. And keep in mind that not everyone wants to know this information. If you do not want to know how a loved one may physically die from lung cancer, please skip this article altogether. It is simply provided here for those people who wish to have some idea of what may occur and may be hesitant to ask their loved one's oncologist. You do not need to know this information to provide the best of care and love to your family member or friend. There hasn’t been a lot written about the causes of death in lung cancer patients, but one study broke down the immediate and contributing causes of death for 100 people. The percentages might vary between studies, but this study does give us an idea of what to expect if a loved one is in the later stages of lung cancer. The presence of tumor was the cause of death in 30 percent of people with lung cancer, a statistic that was further broken down to 4 percent of people dying from "tumor load" in the lungs, and 26 percent due to "tumor load" from metastases. What this means is that the amount of cancer tissue present either in the lungs, or regions that lung cancer spreads too (most often the liver, bones, the brain, and the adrenal glands), led to death. Infections were responsible for death in 20 percent of the patients. For 12 of these people, it was pneumonia; for 8, it was sepsis. Sepsis is best described as an overwhelming infection that begins in the bloodstream and spreads through the entire body. When lung cancer spreads to other regions of the body, it can interfere with the normal functioning of those organs. For example, if lung cancer has spread to the brain, it may interfere with normal brain functions such as the ability to walk, talk, and swallow, or even result in a hemorrhagic stroke. The spread of lung cancer to the liver can interfere with the liver's ability to do its job of removing toxins from the body, and the buildup of toxins may in turn cause death (this is usually painless, as people slowly become less alert). The spread of lung cancer to the pericardium (the lining surrounding the heart) can result in bleeding between this lining and the heart, resulting in compression of the heart and subsequent death (this is often rapid and painless). These complications were responsible for 18 percent of deaths. Pulmonary hemorrhage, or bleeding into the lungs, was responsible for 12 percent of deaths. Even a small amount (more than a teaspoon or two) of bleeding in the lungs (which often results in the symptom of coughing up blood) can be a medical emergency. This is a symptom which many people which to address, as bleeding into the lungs in smaller amounts can result in a feeling of suffocation. When massive bleeding occurs, however, death is usually rapid. Blood clots (deep venous thrombosis) in the legs that break off and travel to the lungs (pulmonary emboli) caused 10 percent of lung cancer deaths in this study—a significant finding, as blood clots are sometimes preventable, and often treatable. Looking at the causes of death with lung cancer from a functional standpoint, respiratory failure was the immediate cause of death 38 percent of the time, whether caused by tumor load, pneumonia or hemorrhage. It’s important to note that most people had more than one mechanism contributing to death. Complications of treatments such as chemotherapy and radiation therapy A low white blood cell count from chemotherapy, with a resultant overwhelming infection, is not uncommon for those in that later stages of cancer. Medical and medication errors. Unfortunately, hospital errors rank far too high in ultimate causes of death. The risk of these can be minimized by asking a lot of questions, asking further questions if you do not understand something or are uncomfortable with something that is happening, and taking an active role in the care of your loved one. Complications of surgery, such as anesthesia complications and bleeding. Conditions unrelated to cancer, such as heart attacks due to blockages unrelated to cancer. In asking about the causes of death, what many people fear is that their loved one will suffer as he/she dies. It's important to note that, even though it's common for people to stop eating and drinking near the end of life, the sensation of hunger and thirst also declines. Regarding pain and difficulty with breathing, the majority of people can be kept comfortable under both conditions in the comfort of their own home. The care and comfort of people who are dying have changed drastically with the use of hospice programs, which can also be a tremendous source of support for the families of those who are dying. One of the biggest fears for those living with cancer and their loved ones is that pain at the end of life will be severe. In fact, in asking these questions, "How will I die,' many people are really asking, "Will dying be painful?" Some people do have severe pain at the end of life while some people have very little pain. The important point is that nobody needs to die in pain. Absolutely nobody should die with uncontrolled pain. When talking about death, many people experience grief that’s not unlike the grief that occurs after an actual loss (anticipatory grief). Grieving before death is not only normal but may allow families to come together to heal from past hurts and form memories that will never die. You may be coping with feelings of grief even though your loved one is still alive. If you're wondering about how your loved one may die, you may also be wondering what happens in the final stages of lung cancer. This can be a terrifying time, yet at the same time, a beautiful time in many ways. Take a moment to learn about what may happen physically, emotionally, and spiritually. It's important to note that it's not uncommon for people to know they will die soon, something referred to as nearing death awareness. Your loved one may speak of talking to other loved ones who have died before. 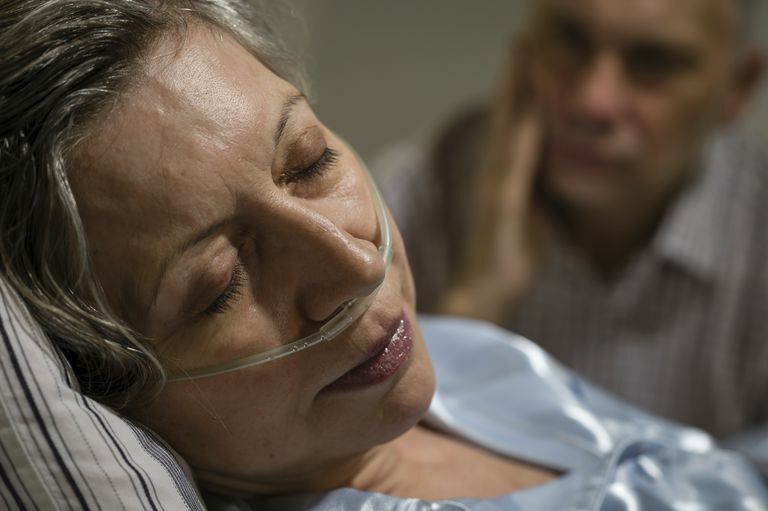 While this can be frightening and many people believe their loved one is hallucinating, hospice nurses will tell you that this happens often, and those who are dying may become very agitated and upset if you don't appear to believe them. Instead of facing this time with fear, families who are aware of this occurrence may take comfort from what hospice nurses experience often. In their book "Final Gifts: Understanding the Special Awareness, Needs, and Communications of the Dying," hospice nurses Maggie Callanan and Patricia Kelley relate the common but misunderstood comments from those who are dying and appear to have one foot in each of two worlds. Janssen-Hejinen, M., van Erning, F., De Ruysscher, D., Coebergh, J., and J. Groen. Variation in causes of death in patients with non-small cell lung cancer according to stage and time since diagnosis. Annals of Oncology. 2015. 26(5):902-7. Nichols, L, Saunder, R., and F. Knollmann. Causes of death of patients with lung cancer. Archives of Pathology and Lab Medicine. 2012. 136(12):155-7.